Congratulations to our Maths Challenge winners in S1 and S2 this year. 16 pupils received an award, which is fantastic! Congratulations to Divine Ofosuhene, who was Best in Year and won a Gold Award! Imogen McFadden, Daniel Mathieson, Kamil Balinski, Sophie Oates and Lara O’Hanlon all won Bronze. Congratulations to Paul Murphy, who was Best in Year and won a Gold Award! Your teachers are very proud of you! A special thanks to Miss Lees who helped some of our maths superstars get challenge ready. On Tuesday 14th March pupils and staff in the school celebrated Pi day. Pi jokes were added to the daily bulletin, the maths teachers wore a variety of Pi related clothing, Pi quizzes and colouring sheets were available from the library and Pi facts were added to the school twitter feed. S1 pupils all worked together in the Kamwokya room to create a colour coded paper chain that displayed the first 1000 digits of Pi. S2 had double fun, writing Pilish poems in English, where they had to use the digits of Pi as the word lengths in the poem. They then arrived at maths and made Pi Skylines, representing the digits visually as buildings. At lunchtime pupils could take part in a Pi recital. A closely fought battle ended with an amazing S1 Imogen McFadden reciting 109 digits from memory. Mr Drummond presented the winning pupil with a trophy and a Pi cookie. The S2 winner of the Pilish poetry also received a cookie as a prize. The staff were surprised and happy to find apple Pi(e)s delivered to their departments at lunchtime, courtesy of PT Maths Mr Drummond. Thanks to everyone who made the day such a success! 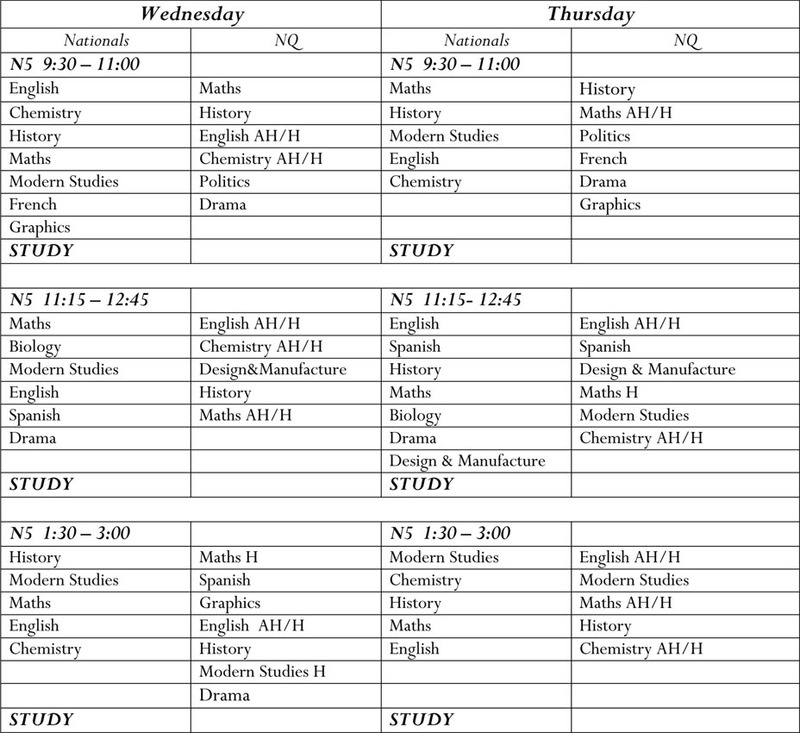 The Maths Department are offering all S4 pupils who will sit the National 5 Maths exam this May the opportunity to participate in a Revision Away Day on Saturday 18th March. Pupils will particpate in tasks and workshops throughout the day designed to help them focus on exam questions, strategies and techniques. As a reward for their hard work the day will end with a visit to Air Space, East Kilbride. All food and transport are included in the £20 price as is the two hour Air Space session. It is an excellent opportunity for pupils, who are urged to return their tear-off slips and payment ASAP. 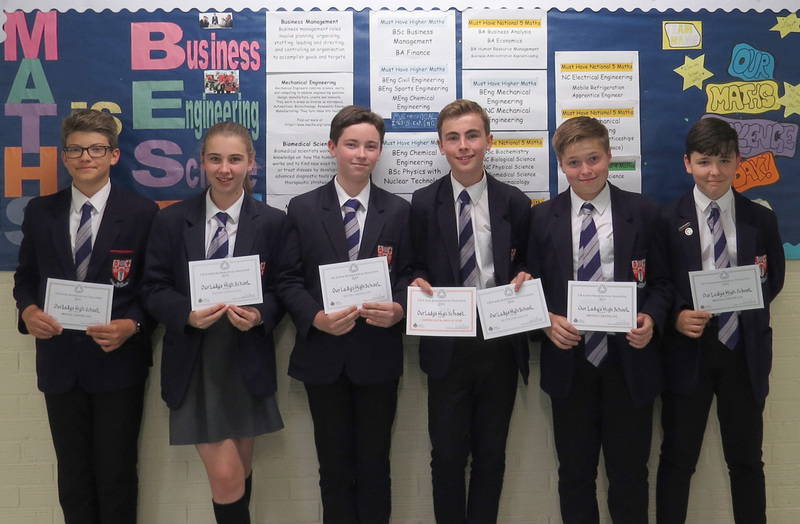 Six pupils received awards after taking part in the UKMT Junior Maths Challenge. Maria McClenaghan, Paul Murphy and Ciaran Hendry all received Silver awards and Philip Meikle, Luke Robertson and Olek Kyc received Bronze awards. Paul Murphy also received the award for Best Score in the School. On Friday 3rd June, our S1 pupils were out of their usual classes to take part in an Enterprise day run by the Maths Department. Groups of pupils completed activities in the morning including Match 10 (a fun online maths game), Orienteering in the school grounds, Tower Building and a variety of other tasks requiring a mix of teamwork and problem solving skills. The afternoon was spent in the games hall completing a very energetic maths relay. Teams were awarded points in all activities and the relay. Congratulations to the winning team: Nial Burke, Keela-Chae McCreadie, Paul Murphy, Lucy Thompson and Paul Welsh. All S1 pupils are entitled to a £10 voucher on opening a credit union savings account. Each time they deposit any money at all they earn points on their Young Scots card and can win prizes based on these points. This is a great way for our first year to take on some responsibility and learn about saving. Mrs Anderson (PT Maths) and Mrs Woodside from the Maths Department are currently distributing the credit union forms. To open an account and receive their £10 voucher the pupils simply need to fill in the form, sign it (signature from guardian also required) and bring it back to school. Staff displayed their favourite poems for National Poetry Day 2015. Ms Steinert also offered staff the chance to create a poster for their poems using Illustrator software. All images copyright free or used with permission at Mrs Macfadyen’s insistence. On Friday the 8th May the Maths Enterprise Day took place for all first year pupils. It was a very successful day and the pupils thoroughly enjoyed it. In the morning the pupils were put into teams and made their own team banner. They then took part in a variety of activities within the maths department. Favourites included the activities from ‘ITV’s The Cube’, building a tower, and the paper ring (where the record was 24 pupils inside one paper ring using nothing other than ONE sheet of A4 and a pair of scissors). In the afternoon the pupils went to the Games Hall to take part in the Maths Challenge Relay. Pupils were set challenge questions and had to race to see which team could answer the most question and achieve the most points. In the end, after much frenzied and frantic running around, Team 10 were named the Champions with 270 points. The winning team, Wiktor Witkowski, Daniel MacLeod, Dylan Kelvin, Weronika Kahl, Anam Rehman and Ewan Jeffrey, all received a gift voucher and the all the associated glory of being complete mathemagicians!!!! P1/2/3/4: Damian Bonnar, Erin Burt, Molly Cuthbert, Luke Dickson, Saoirse Higham, Marc Hobson, Declan Kane, Rebecca McQuaid, Heather Nugent, Mark O’Rourke. P5/6: Kenny Barr, Rhodri Bevan, Damian Bonnar, Jack Burnett, Erin Burt, Molly Cuthbert, Luke Dickson, Emma Dolan, Hannah Duddy, Saoirse Higham, Marc Hobson, Declan Kane, Ryan Kane, Kelsey Kearney, Jamie Lester, Dearbhla McCabe, Kate McDonald, Louise McLaughlin, Joseph McNally, Rebecca McQuaid, Eirinn Molloy, Heather Nugent, Mark O’Rourke, Patrick Quinn, Matthew Robertson, Kayleigh Rowatt, Niamh Simmonette, Euan Stevenson, Clare Thompson, Anthony Weir. Pupils and staff celebrated St Andrew’s Day with a whole school “Tartan Day”. Pupils were allowed to come to school out of uniform and were asked to wear something tartan or Scottish. The school was very colourful with tartan kilts, trousers, tops, tammies etc on parade. They were asked to donate £1 to St Andrew’s Hospice for this privilege. The event was organised by Andrew House pupils and Mrs Connor. As well as Tartan Day there were other events around the school including the sale of tartan bows and ribbons. A staff coffee morning took place at interval with Michael Clark (Andrew House Prefect) playing the bagpipes and Emma Kirkwood and Declan Murray from 1A singing Loch Lomond. During lunchtime a “Scots Corner” was set up, selling saltire cupcakes, tattoos and face painting. Again, all proceeds going to St Andrew’s Hospice. The Maths Department even got in on the act by delivering lessons on designing your own tartan. A great day was had by all. The final total of money isn’t in yet but will be well over £500. 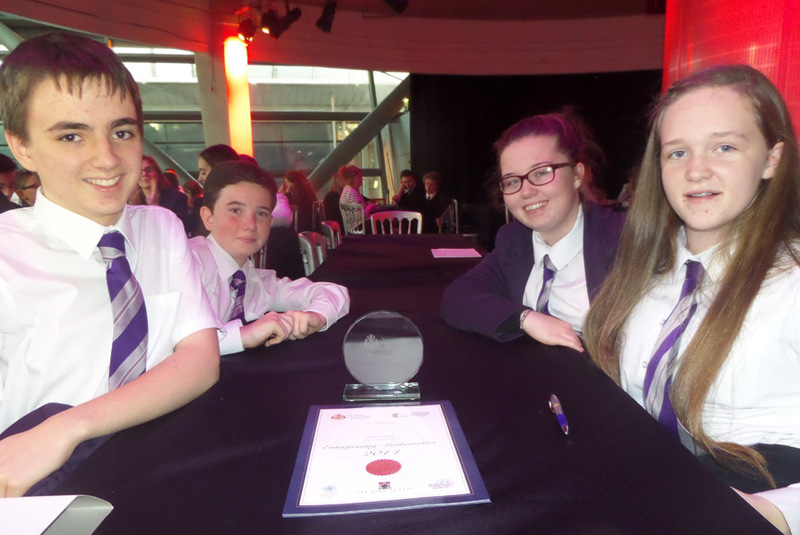 As one of four schools in North Lanarkshire to qualify, Our Lady’s High School attended the Scottish finals of the Maths Enterprise Challenge in Glasgow Science Centre. 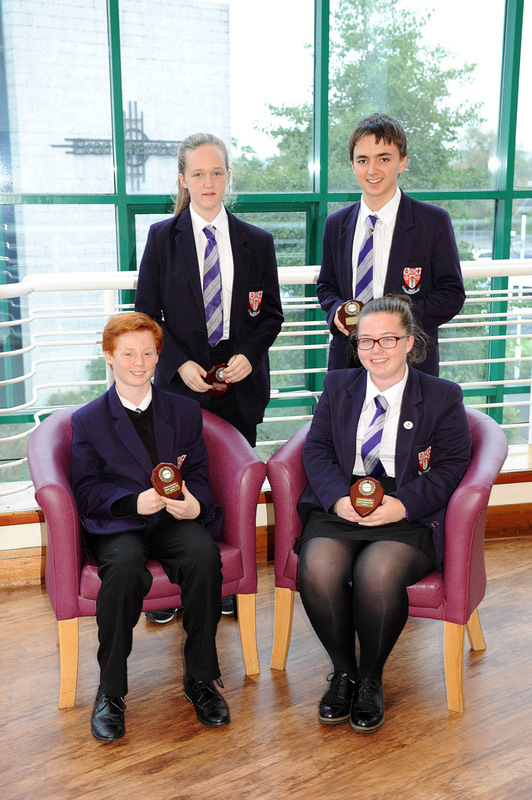 The four pupils, Patrick Quinn, Niamh Simmonette, Magen McNulty and Michael McKenna, competed fiercely, tackling difficult maths problems in four challenging rounds against 61 other schools from across Scotland. Although the pupils did not win, they worked extremely hard, had a brilliant time and thouroughly enjoyed their day. 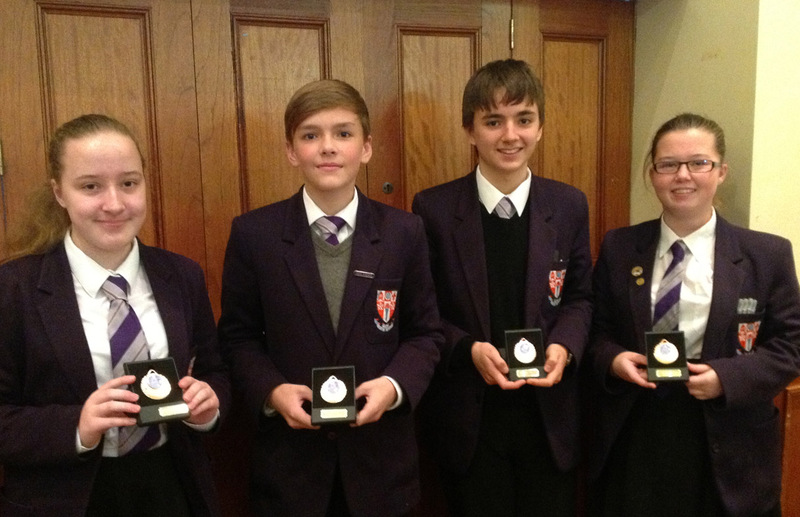 On Friday a team of four pupils from OLHS were second in the Maths competition for schools in North Lanarkshire. 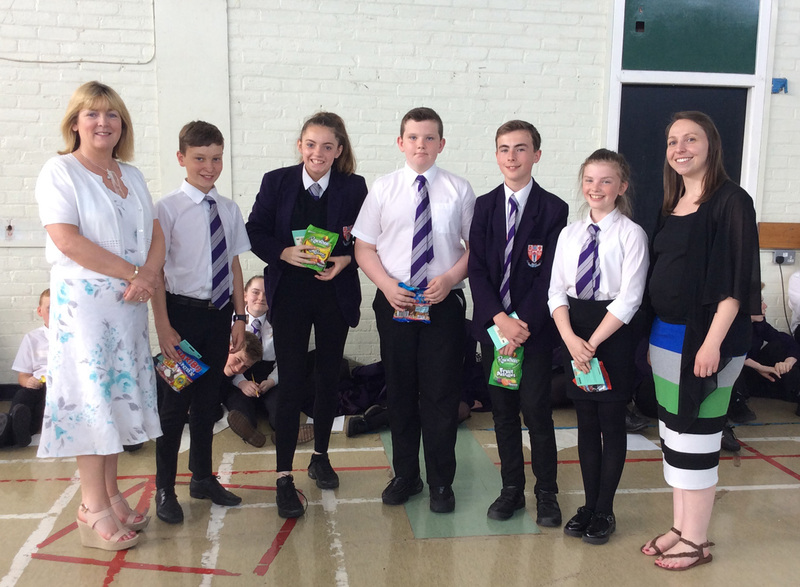 There were 23 teams entered in the competition and the team consisting of Magen McNulty, Michael McKenna, Niamh Simmonette and Rhodri Bevan put in an excellent performance to finish second. 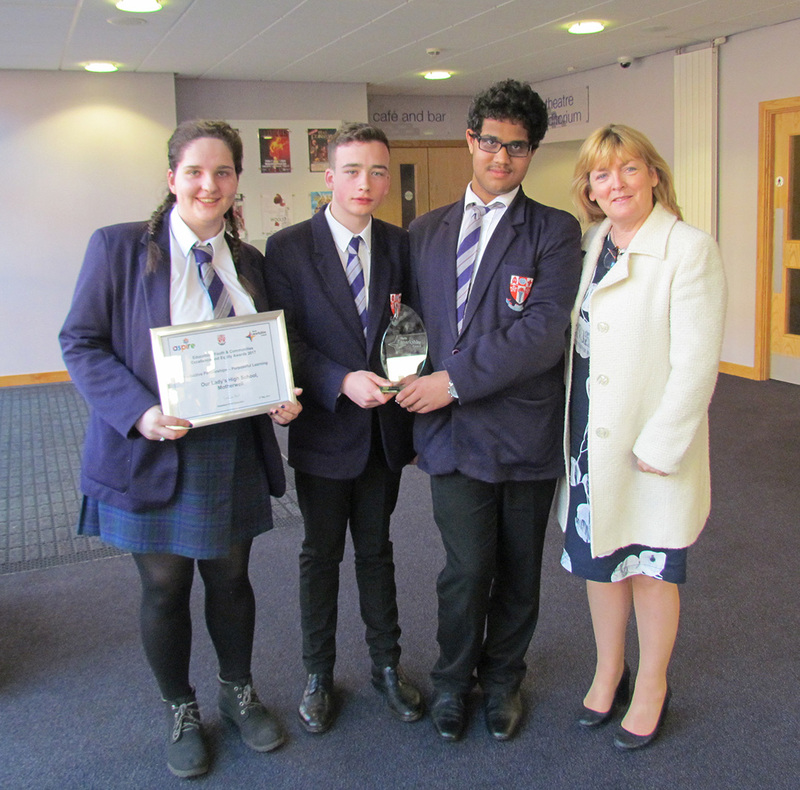 Our Lady’s, along with competition winners, Coltness High School, will now progress to the national finals, which will be held at the Glasgow Science Centre in November. SCHOLAR are offering a study support session with our Online Tutor for Maths, Margaret Ferguson, Friday 2nd May at 1 pm. Sign in as a guest on the site. Please check you have access in advance. A team of our pupils took part in the National Finals of the Maths Challenge Competition yesterday in the Glasgow Science Centre.This is the first time we have made it to the finals, having come third in the North Lanarkshire heat. There were 56 schools from all over the country who had won their regional heats.The day consisted of a range of mathematical challenges but also included an hour to explore the Science Centre as it was closed to the public. The pupils had a great day and finished 32nd ,which with 397 secondary schools in Scotland makes them in the top 10% in the country. The team consisted of Sophie Tougher-Mitchell, Owen Leach and Lewis Donnelly from S4 and Magen McNulty and Michael McKenna of S3. Congratulations go to them for a great performance both yesterday and in the heats . The date of the national final of the Maths Challenge competition is approaching. A group of four pupils from S3/4 will be competing against approximately 50 other schools in Scotland who made it through to the grand final. This is the first time a team from Our Lady’s have made the final, which will be held in the Glasgow Science Centre on 19th November. Representing Our Lady’s is Lewis Donnelly and Sophie Tougher-Mitchell from S4 and Magen McNulty and Michael McKenna from S3. Best of luck to them! Our Lady’s High School came third in the North Lanarkshire Mathematical Challenge competition yesterday in Cumbernauld Town Hall. All 24 secondary schools competed in problem solving activities and working in a team followed by a relay in the afternoon. The pupils are now going forward to the national competition later in the year. The Our Lady’s team consisted of Sophie Tougher-Mitchell & Lewis Donnelly from S4, and Magen McNulty and Micheal McKenna of S3. Huge congratulations go to them on a fantastic achievement. On Monday 24th June all S1 pupils were split into 20 groups and participated in the 2013 Mathematical Challenge. In the morning they were involved in activities which included, building a tower with straws and tape, attempting activities based on the TV program ‘The Cube’, moving paper cups without touching them, catchphrases, using the new ads in the school and trying to get as many pupils through a sheet of A4 paper! The record for the final activity was 20! In the afternoon the teams ran a relay of maths questions in the Games Hall and to give them a rest they had some other quiet activities. The pupils thoroughly enjoyed the day and can be commended for their enthusiasm, teamwork and behaviour. The challenge was won by Group 5 and the successful pupils were Emma Dolan, Nicole Clarkson, Sophie Bradley, Aidan Burke and Zak Docherty. Congratulations to all!